North and South Korean family members spend time together for the first time in over 60 years. Korean family members, separated by the Korean war in the 1950s, have spent time together. Which of these does NOT mean separate? 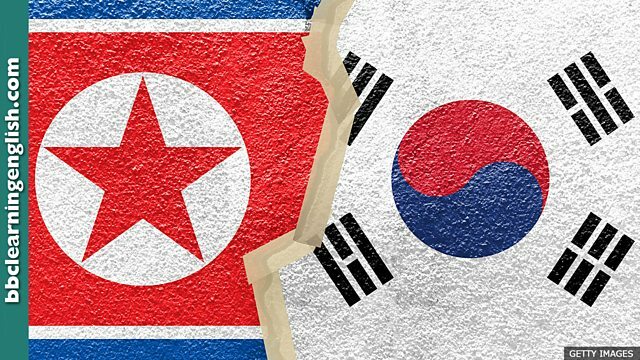 Dozens of South Korean families have been meeting relatives from the North in the most tangible gain yet from the improvement in relations between the two countries. The South Koreans were separated from their relatives by the Korean War. • It was with some trepidation that Dan asked his girlfriend to marry him. • She walked towards the judge bravely and with no trepidation. • If you see Sam crying, don't worry. He's just a bit tearful about his recent breakup. • The end of the movie was so beautiful. It made me tearful for hours. • Living there was a bittersweet experience. I learned a lot, but I missed my family. • All the best stories have bittersweet endings. A happy ending is so clichéd. There are no double letters in this word! What is the correct spelling of this word, which means 'crying or likely to cry'? This word often means 'together'. Which preposition is often found with the word 'trepidation'? This word relates to how we feel about experiences. We use the word 'bittersweet' to describe... what?